Books 14 & 15: Final Week to Back Them! The Kickstarter for Schlock Mercenary books 14 and 15 closes next Thursday. Our final three stretch goals are within reach, and but the very last one might be particularly interesting to you. 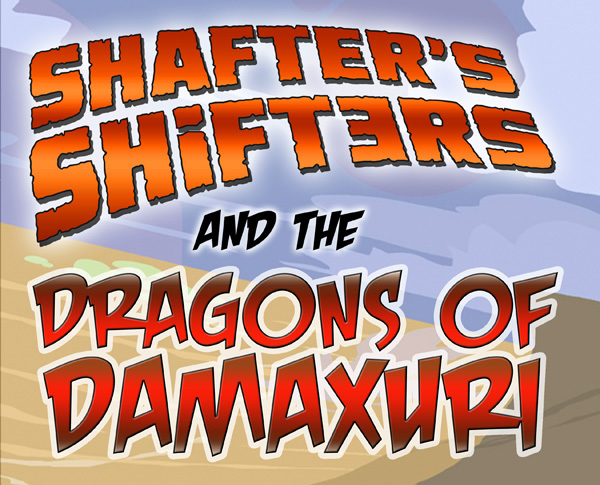 The stretch goal is for R&D: if we meet the $125k mark we will be able to budget enough time for me to write a novel, sort of a pulpy adventure-mystery thing, about Shafter’s Shifters. Think “Doc Savage” meets “Dirk Gently,” with amorphs. We won’t be delivering the novel as part of this Kickstarter. That would slow down the delivery of the two three books already promised. It will be its own project, available for pre-order or project-backing sometime in 2019. And yes, if the book does well enough, there could be more of them. But let’s not get ahead of ourselves. 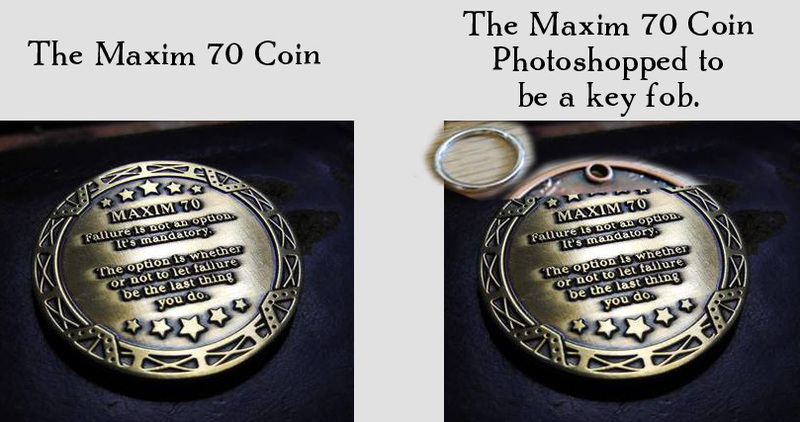 We’ve got one week left on the current project, and we’ve already funded sufficiently for some cool stuff like Maxim 70 Key Fobs and short story collections. 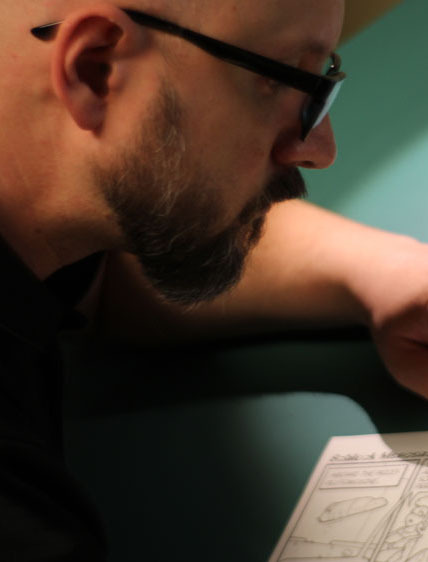 The remaining stretch goals—JSC and Sanctum Adroit Coins, a Sketchbook Retrospective PDF, and the Shafter’s Shifters R&D—are still just goals, and they’re not things we can reach without your support. Click through to the Kickstarter and join us! The Kickstarter Project for Schlock Mercenary books 14 and 15 has overfunded, and we’ve added an ebook of Howard’s short fiction to the deliverables. That means it’s now a three book project. The collection is just over 46,000 words of non-Schlock Mercenary prose, and it’s available at no additional charge to backers who are getting the two Schlock Mercenary books. It’s also available on its own. For more details, check out the project! 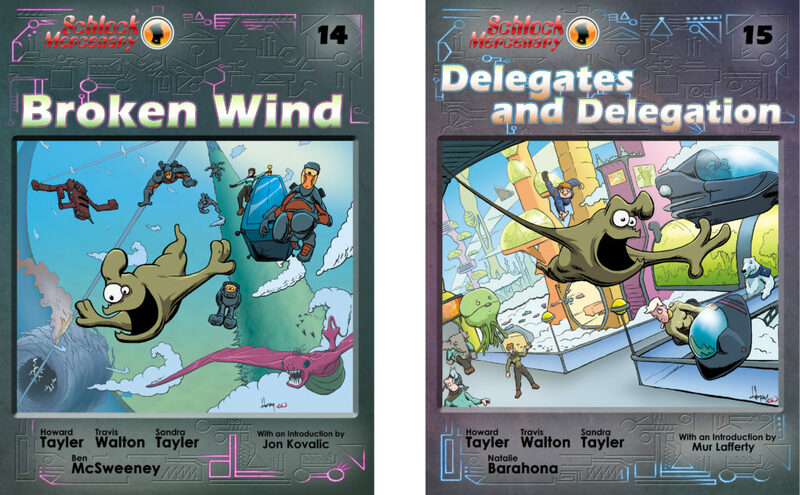 Here’s the two-book Kickstarter for Broken Wind and Delegates and Delegation, volumes 14 and 15 of Schlock Mercenary. Everything you need to know about the project is over there at the project, and there’s even a FAQ for those things that you need to know, but which we didn’t know you needed to know until your need to know was made known. Electronic versions of both books are included with your pre-order, and should the project over-fund sufficiently, we have some stretch goals. They include new challenge coins for the fleet of Tagon’s Toughs vessels, an ebook collection of some of my short fiction, and some stretchier goals which we’re keeping hidden for the time being. We’re excited to finally be putting these two books into print. I love the stories, and I’m pleasantly resigned to the fact that with each book we release we get better at this thing we do. Once Broken Wind and Delegates and Delegation are bound up and laid down on paper they’ll be the best two books we’ve made. 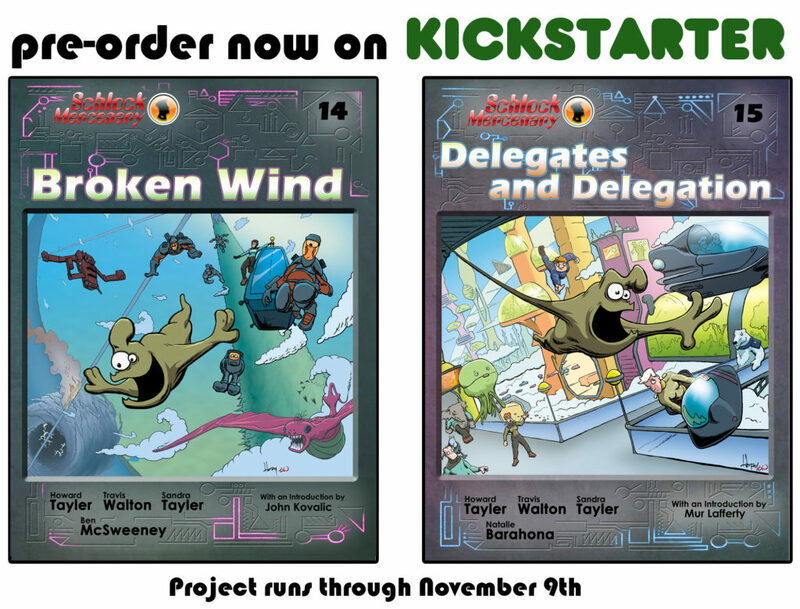 This Tuesday, October 16th, we’ll be opening a Kickstarter for print editions of Broken Wind: Schlock Mercenary Volume 14, and Delegates and Delegation: Schlock Mercenary Volume 15. Each volume has a bonus story at the end, lots of margin art in the middle, and the same top-shelf quality of binding, printing, and glossy paper that Schlock Mercenary fans have come to expect. The bonus story in Book 14, a tale of the terraforming war, was written by Howard Tayler and illustrated by Ben McSweeney, with colors by Travis Walton. The bonus story in Book 15, a story of mixed greens, parenting, and pirates, was written by Sandra Tayler and illustrated by Natalie Barahona. We’ll post more details next week when we launch.